Neutral colors & modern classic furniuture…I love the juxtoposition of old and new. Furniture that actually matches a color in the rug, with pops of other colors as accents. All whites and neutrals, this really shows of the rug if you love the pattern and color of the rug. 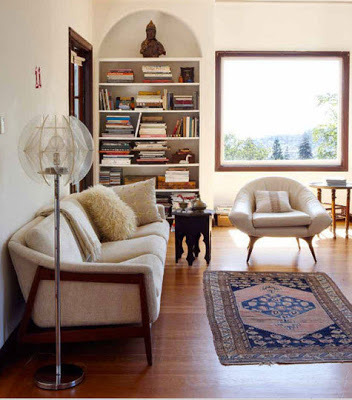 Traditional furniture that is neutral and somewhat matches some tones in the rug. 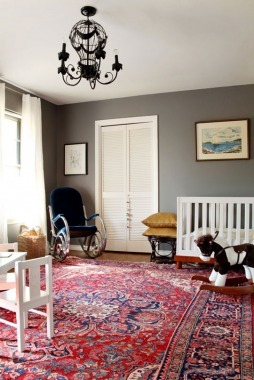 Persian rugs are often red and blue- I love the charcoal grey walls with this rug. Fabulous! This is a rare Persian rug with pinks and oranges…but if you’re lucky enough to have a unique palette this is gorgeous. Use a complementary color on the walls like this robins egg blue! Subtle & tonal. 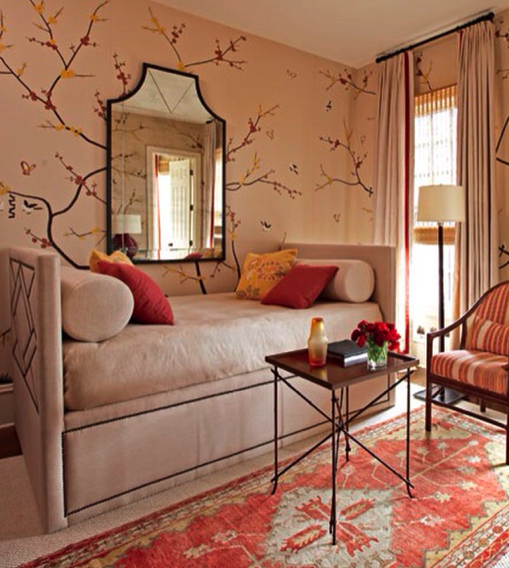 Do something interesting on the walls like a stencil or wallpaper. Modern setting with a complementary colored sofa. Again, I love the robin’s egg with the darker red rugs especially. 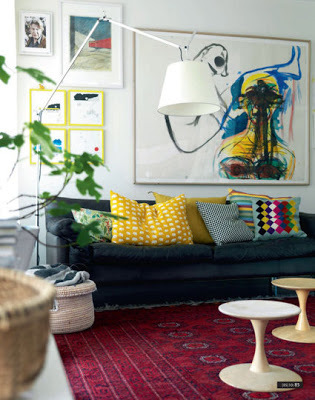 Bohemian & eclectic with some colors matching the rug. Clean, traditional and contrasting. 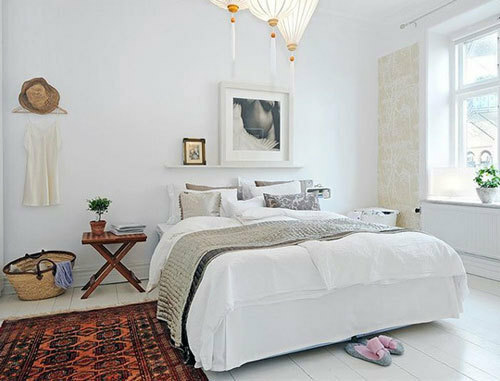 Bright white is always beautiful with intricate patterned rugs. Natural tones and textures and interesting shaped furniture. Love this feel. Funky furniture and solid throw pillows- an easy way to match your persian rug. Dusty tones can be really pretty with the more muted rugs. Love the dark teal. Elegant and refined…makes perfect sense with a persian. Ethnic and matching in all one color- this could work with a multicolored rug as well. And one of my own designs- modern classic furniture, block-printed fabrics, matching palette. My first job at The Pacific Design Center was at a rug showroom JH Minassian and I was in love with all of the beautiful antique and reproduction rugs!!! Great post! I love these photos!! Thanks so much for posting them! Caitlin – you are a dream and I love the inspiration you have found so far. Great mix of old and new. Can’t wait to see what’s next! 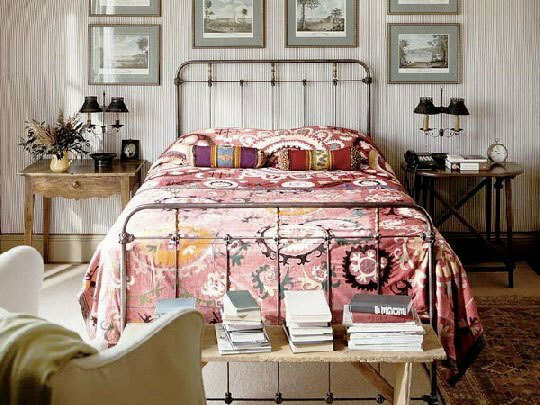 It’s so funny that even though Persian rugs have so much color and pattern, they almost act as a neutral in a room, and you can do so much with them. LOVE these inspiration images, and I haven’t seen a number of them before. Thanks! 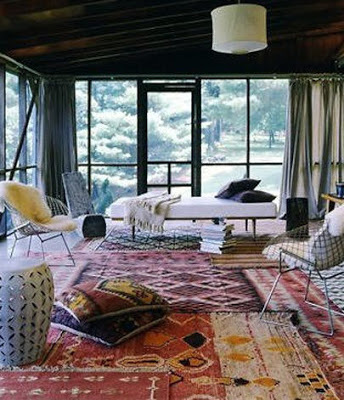 And this post is timely, as persian rugs seem to be coming back. Feels like a more taditional take on all the sort of global kilims that are popping up everywhere. 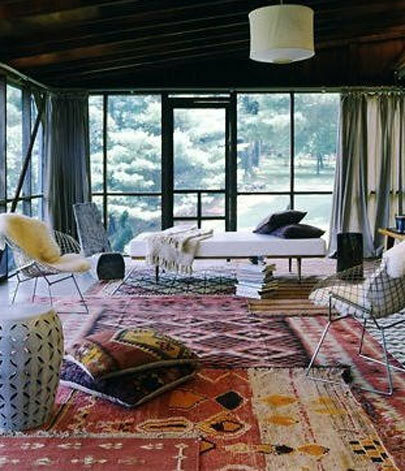 I love persian rugs and hope to own one someday. I love the images you chose to showcase how to use them. Just stunning. I just loved all of these examples: these rooms display the placement of a Persian Rug in such different ways but all are unfussy! Another combo I think looks great with persian rugs is mid-century, which I usually don’t prefer but I like it with persian rugs! 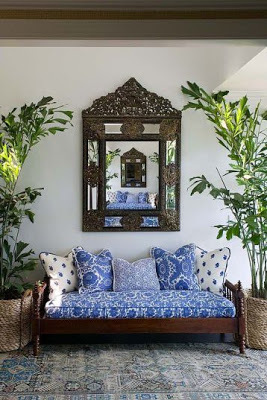 I loved this post since I have a persian rug and have been trying to figure out what to do next to change up the room. I loved your design with the block print pillows – hadn’t occurred to me to do that so thanks for the great ideas! Socialfuel, a Houston Web Design Company. 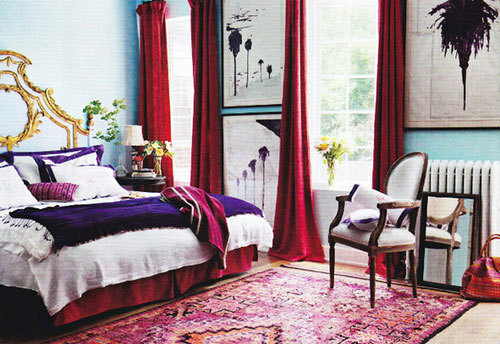 parliWow, Your room is beautiful with Persian rugs. Really I appreciate your work. These are such nice modern rugs. So many different ideas to work around your rugs and all so wonderful. When you think about it, decorating ideas with these beautiful rugs are just endless. I love the printed red rugs . They really accent a room and bring it all together. I love the look of layered rugs like in the first picture. Great ideas here! The first design looks refreshing and relaxing..love it. i always like to decorate home with Modern Area Rugs in different styles. Very nice pictures! Thank you for sharing. Persian rugs give prestige. I have a red couch and red rug? The rug is an older Persian rug, can I use them in one room? Should I replace the couch? I have been swooning over these Persian rugs for weeks now, this post definitely gives me the courage to take the plung and purchase! I do have a question though, how many Persain rugs are too many? For example I have a rec room that I wold love to put one and also under our kitchen table but there is a direct site line between the two rooms. Any suggestions ?